Maria's Mélange: Batty About Geeks, Girls, and Secret Identities - THE END! 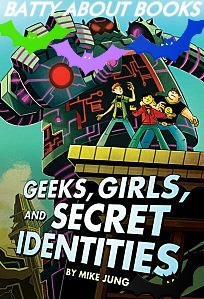 Batty About Geeks, Girls, and Secret Identities - THE END! My thoughts are hosted here in purple, Kathy (aka @thebrainlair) responds in blue, and Sherry (aka @LibraryFanatic) chose the green pen. It's been a treat to have her along for the ride this time! As always, be sure to check out the other blogs for more of our discussion. I’m working off of just some notebook entries, because several children in my class begged me for my copy. As I mentioned last week, I’m doing a brief unit on humor with a small group of advanced fourth grade readers. They each have a different book, and we’ll be sharing the things that we found funny about the stories (or writing style). Just looking at the cover and hearing the back blurb made the whole group chuckle. I’m curious to hear what the girl who ended with with this one thinks. (The other titles grabbed were Fake Mustache, Horton Halfpott, Hero’s Guide to Saving Your Kingdom, and We Are Not Eaten by Yaks) Ooh! I'm curious to hear what she thinks too! Of those 4 titles, I've only read the 2 Tom Angleberger ones. I really need to read The Hero's Guide series! I read Fake Mustache and Hero’s Guide, both of which I enjoyed but got a little tired of the tropes towards the end. I would love to know what girls think especially since I feel both those titles have strong girl characters in them. I don’t want to put any spoilers in, so I’ll keep this vague. I was wrong about Bobby, and my two buddies were right. I don’t feel bad about that... I guess I’m just the overly suspicious type. Bobby was perfect, so I wasn’t disappointed - and I didn’t feel like my guesses were me being “tricked”. I’d be curious to hear more about him, though, if the book ends up with a sequel. I do still think he’s a bit of a superhero chaser. (And that’s okay!) It was good knowing he was like Vincent and even a member of the fan club. He does seem to take a deeper interest in Stupendous, even more so than Janet and she’s a president of one of the fan clubs. I love how he talks to kids and lifts them up. Seeing their reactions to his trust and encouraging words reminds me how much influence we have over children. I really enjoyed Polly in this book. I love how she is shown as rich but really not spoiled. I feel sorry for her, since her parents aren’t involved in her life in the way that she wants. But she seems to handle the wealth well. I loved how, when Vincent commented on her being rich, she replied “no, my parents are.” Great answer from Polly. Definitely shows her maturity! Good head on your shoulders, lady! This section seemed to have a lot of commentary on growing up - on learning how to deal with being a kid while the adults around you don’t understand you - and on learning how to accept and treasure who you are. I loved these messages. I think reading about these types of things makes a big impression on kids...at least I hope it does! Polly: “It’s just that it’s messed up, turning into a grownup” (195)- Yes, she is talking about how SHE transforms into Captain Stupendous, but it still echoes how I felt when I was about her age. We all wanted to be grown up, but not really. Then Vincent responds with, “It must be even worse being a girl!” (195). Polly gets defensive, but it’s kind of refreshing that they even had this discussion. Boys and girls won’t really know each other’s realities until and unless they talk about it. Yes, it stinks that Vincent assumes it is awful to be a girl. Yet him bringing it up with her gives them a chance to air it out a bit. The discussion stalls, but I can hope that they’ll go back to it later. I felt defensive too, so I was glad Polly smacked him, called him a moron, and then explained her point of view! On the one hand, I wish Jung would delve into these issues, but on the other hand, I think that might stall the book and turn off some readers. He puts enough into these scenes to be provocative and, hopefully, make students think. It would also be a great time for a grown-up to discuss these issues with the readers. Would make a great Parent-Child book club book. The boys jokingly express their concern for one another. Vincent knows they care, because they were worried about him. He responds with “Awww, you guys totally love me” (188). The comment on that being “gross”, but everyone is smiling. I hope we’re moving into a world where guys can admit that they love their friends. Having more books like this will certainly help!! I haven’t really come across a book that does guy friendships this well, outside of the YA books Swim the Fly and Stupid Fast, and even then you don’t really have them say the word “love” like Vincent uses, even jokingly. And I can’t think of one television show that does that. Vincent and Polly have their first real “connection” moment when they talk about their fathers. This was written to make them seem so uncomfortable and unsure of themselves that it almost feels like Mike Jung was watching a real middle school pair as he wrote it. Or remembering his own middle school years...that would be great to find out from him! Do you have any ideas of superhero books to add? Especially ones that feature prominent girl characters? I know plenty of superhero comics, but most of those aren't things I would put in a middle grade library! Added Bonus! The Brain Lair is raffling off her ARC http://www.rafflecopter.com/rafl/share-code/N2E5ZTM1MjllNTMwNjQ1NWFkYzU0MzQ0ODA0ZmE5OjU=/ - since she has the hard cover for her library. Be sure to enter!